Pour a cup of coffee and create a life worth living! Would you Like to Guest Post? One of the best things about my Bullet Journal is that it provides a road map for me. It sets a destination and a way to get there. For a while, I felt stuck in the mud, like I was just treading water, going from day to day, and not really having a purpose and a reason to get out of bed every day. I knew that if I didn’t do something, I would spiral into a depression. I had already started researching what bullet journaling was, but the fact that I could set and track goals was what really appealed to me. I started watching YouTube videos about bullet journaling, and one video I came across really resonated with me. Kara Benz, of Boho Berry talked about something called Level 10 Life, originally created by Hal Elrond and his book The Miracle Morning: The Not-So-Obvious Secret Guaranteed to Transform Your Life (Before 8AM) . This program breaks your life into 10 different categories and score yourself on a “level” out of 10. Then you create goals that would get you to “Level 10”. Elrond breaks the categories into Family & Friends, Personal Development, Spirituality, Finances, Career, Marriage, Fun & Recreation, Giving/Contributions, Physical Environment and Health & Fitness. I modified my list a little bit to customize it to the goals I was wanting to meet this year. For example, contributions isn’t an area that I really want to focus on right now, but I’m wanting to grow my social media presence and wanted a separate area for that. As you can see, I feel like my areas where I am the closest to where I want to be are in the area of Personal Growth and My Home as these are the two areas that I have been actively working on over the past several months. The areas I am farthest from where my goal are Family and Friends (because I’m basically an introvert) and Finances. Now, these are huge goals. They’re not something where I can just do one thing and be where I want to be. If I just had this as what I was reaching for, it would feel unattainable. I had to be able to break it down into smaller, more achievable goals. So at the end of every month, I create the next month’s goals. I look at my overall goals and find one or two things that I can do in each category. On my daily page, I have a section for daily goals. These are little things I can do to accomplish my monthly goals. I usually only put one or two things on there that I will be able to accomplish in one day, in addition to my to-do list without feeling overwhelmed. These steps, working from the smallest component, the daily goal, and funneling out to larger and larger goals, has been giving me a purpose and a way to get out of the mud. I am the type of person that always needs a goal, a reason to do what I’m doing. I can’t just go from day to day and coast through my life. The Level 10 Life has done this for me. What tools do you use to set and achieve your goals? 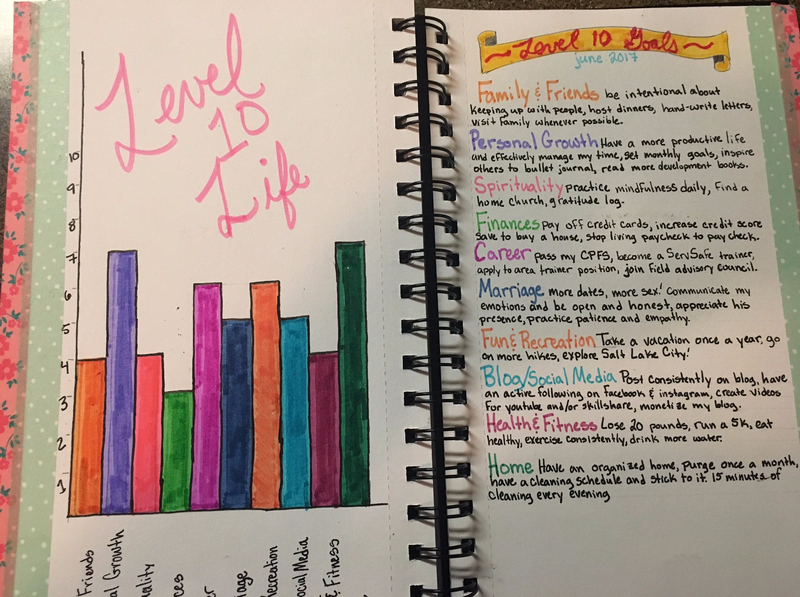 Do you use your bullet journal for goal setting? Next Plan Your Week: Things to do on Sunday to make Monday Better! This is fantastic! We have a similar concept of planning goals. I’ve come to learn that bullet journaling is the easiest way for me to really measure what I’ve been doing and visualize my success!